Group: This shows a list of the availabe groups, you have to select a group to add to current user. If the user has not group, it is not possible give it permissions, neither the user will be able to access to the Load Balancer. This field is requried. 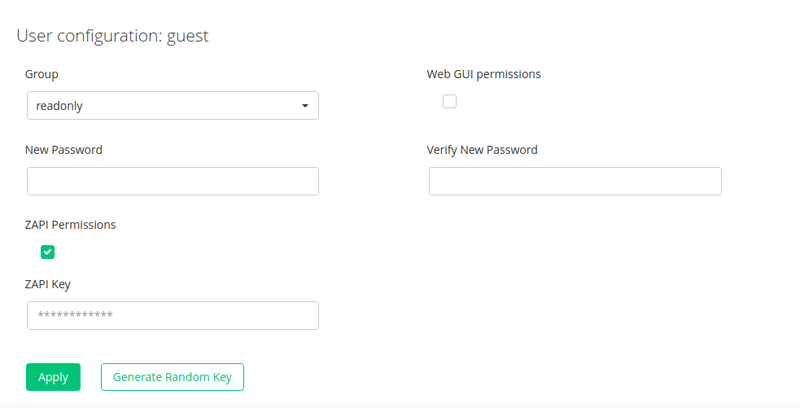 Web GUI Permissions: If it is checked, the user will have permission to access to the load balancer through Web GUI. If it is not marked, the user will be not able to access. New Password: To change the current password of the user. Enter a new password. Verify New Password: This field is required if you enter a new password in the New Password field, you should indicate the password again, as security verification. Zapi Permissions: If it is checked, the user will have permission to access to the load balancer through the API. If it is not marked, the user will be not able to access. ZAPI Key: In order to access to the Load balancer though the API, it is necessary indicate a ZAPI Key, previously defined here. You can not enable the Zapi permissions without define a ZAPI Key for the user. This Key is secret and unique for each user, it is not possible defined the same key for more than one user. You have available the Generate Random Key that it generate a secure random key.